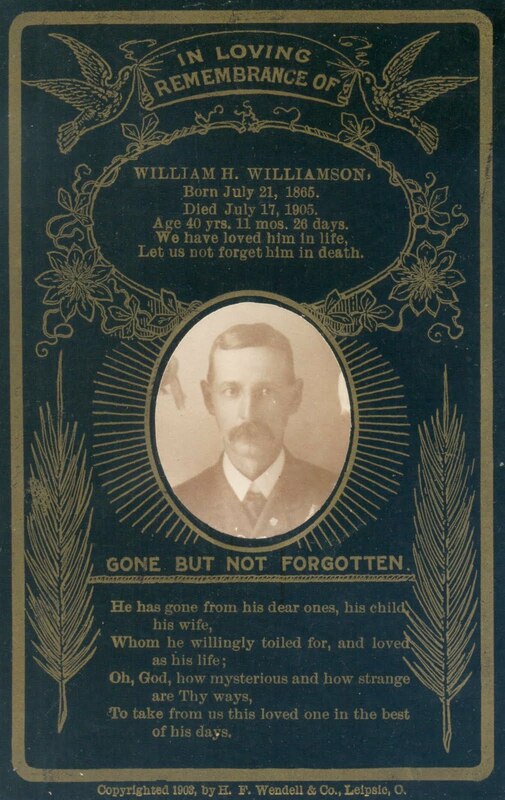 My interest in genealogy began pretty early, at the age of 12, and I quickly found that cemeteries and funeral memorabilia are part and parcel of genealogy research. When I began asking my grandmothers questions about the family history, they both went to their dressers and pulled out their old “keepsake” boxes. They opened them up to reveal their personal archives of obituaries, funeral and memorial cards, and old letters. The most private, and cherished, of these keepsakes were photographs taken at funerals and burials. I was fascinated by the wealth of historical information to be learned from these items, and duly began making photocopies and incorporating them into my research notes. One of my fondest memories of my Grandpa and Grandma Watson is going with them on Memorial Day in the late 70’s to tend our kinfolks’ graves at the Shamrock, Texas Cemetery. Shamrock was about an hour’s drive from my hometown of Pampa, Texas. A week or two before Memorial Day, we’d go to the dimestore and buy lots of cheap plastic flowers and ribbon, then go home and fix them into 11 arrangements, one for each grave. At that time, this municipal cemetery was not well cared for, and we took shovels and yard tools, as well as flowers. My grandpa frequently filled in and leveled graves, especially around my great-grandfather’s grave, which featured a large stone grave cover. I helped and, of course, my Grandma directed all our work! After working all morning in the cemetery, we stopped for lunch at the local diner, then drove back home. In 1978, I bought my first funeral notice in an antique store and have been going strong with that collection ever since. 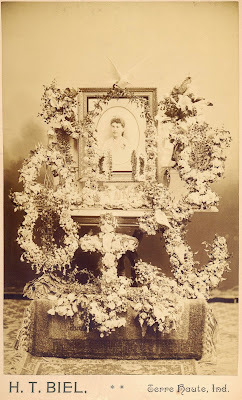 I frequently find funeral memorabilia at estate sales and antique shops, and I feel that these items need a caretaker. I enjoy sharing and writing about funeral photos and memorabilia on my blog, A Land of Deepest Shade, and I hope to contribute to everyone’s understanding of the role these items played in the mourning process, as well as their value to genealogists and historians. My blog title comes from an old Methodist hymn And Am I Born to Die, written by Charles Wesley (author of the famous Easter Hymn), which has beautifully dark lyrics. The tune is really nice, too, and you can listen to the hymn through a link on my blog. Sadly, this hymn apparently no longer “fits” and it was dropped from the last hymnal revision. I love spending time in old cemeteries, especially the ones where my ancestors are buried. I now live in Austin, Texas and I frequently drive about 400 miles across Texas to the Lubbock area to visit family. I always plan the trip so that I can stop at various cemeteries, to “check on” my ancestors and relatives. Some of these relatives have been dead so long and/or they didn’t have descendants, and I doubt that anyone ever visits some of these old graves, especially the ones out in country cemeteries that are off the beaten path. I’m glad that I was born to be my family’s genealogist, and I see it as one of my responsibilities to visit the old graveyards. One of my great-great grandmothers was buried in an unmarked grave in 1924 in Southland, Texas. I recently confirmed the exact location and I’m working on a project to collect donations and mark the grave. I hope to have a dedication ceremony sometime in the next couple of years. I also plan to raise money to re-mark some old family graves at Dexter, Texas, as the original markers have deteriorated beyond repair. I was thrilled when I found the Association of Graveyard Rabbits and I’m honored to be part of this group. All of the GYR bloggers are doing unique and important work in their respective parts of the country. I appreciate having this opportunity to share a little about myself and I hope to hear from you!